Not your typical pour over! The Kalita Wave Series adds ingenuity to a time tested coffee making design. The beautiful glass dripper has a comfortable handle and a plastic collar to keep it in place. The Wave incorporates a flat-bottom coffee dripper with a patented "Wave" filter. Together they create an even coffee extraction that you control. Take a little time to perfect your pour and this coffee dripper design will amaze you with delicious results. The 155 Wave dripper is optimized for brewing a single-serving of brewed coffee. We recommend this dripper for 1-2 tablespoons of coffee, yielding 12-16 ounces of brewed coffee. The 185 Wave dripper is for when you need that venti size coffee. Try 2-3 tablespoons of fresh ground coffee and ideally your yield will be approximately 16-26 ounces of brewed coffee. Relaxing Ritual - Take time to smell the coffee! A perfect pour over takes about four minutes of brew time. Party Pooper - This is not the coffee maker meant for a crowd. Limited capacity is ideal for 1-4 servings of coffee. 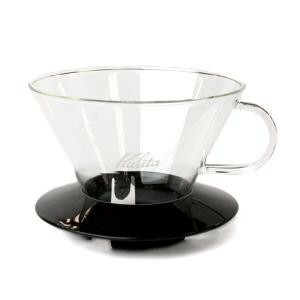 The Kalita Wave coffee dripper is one of the finest pour overs on the market.